• View topic - Defense? No... Wofford plays a 2 safety (Cover 2) look. Rarely do you see us put our safety in the box. In most schemes you would see the SS lined up near LOS and atop a Slot or TE. Ever wonder why our Safety is 12-15 yards away from the slot they are to cover? It's because we use our LB's for underneath coverage instead of blitzes and pressure schemes. WocoSix, I agree with your analysis of things I just don't agree with (IMO) how we sometimes put things on the players instead of coaching philosophy. That's coming from a parent who maybe needs to become more thicker skinned. Wofford plays a 50 defense with 3-4 personel. Maybe the below video will help you. What good is having 2 run support personel on the field at the same time vs a spread pass team? P. S. The Positions marked "E" are LB'S in our scheme. We barley, if at all walked the safety up. All we did was change personel and ask Alstatt to do a LB job. Shorthair13 in no way shape or form would I intentionally single out a athlete. I am like you said questioning philosophy and personel choice vs the Samford spread. Not that my opinion matters but I would have left Alstatt and Rivera at safety and man up the slot with a CB(Gbesee or one of the others man's up #6 or #83 in slot). I'm not sure why we are all surprised with our Defensive philosophy. We have been a bend but don't break defense for years, playing the same old Zone coverage and 7-10 yard (sometimes more) cushions on the corners. And even though we only got a sack or two this week, I thought we did a better job up front on pass rush. There were a couple of clear holds (One on Tyler I remember vividly) that were not called. We did make him move around several times under pressure and he just found ways to hit guys in holes in the zone. That said, we absolutely need to Blitz more and have a little trust in our guys on the back end. Yes, you may get beat every now and then, but you may also get a strip sack or a pick. But picking apart our Defensive philosophy like it is a new problem is like banging your head against a wall. For our coaches, this D has worked in the past (see last year's STATS) and is a way to try and control the game against Spread teams and even though it drives us crazy as fans, you can't really argue with a 6-1 record against the schedule we have played so far. I would reaffirm the above. I think we're going to finish the year with less sacks than we did last year and hopefully in the mid-tier of the socon in terms of total sacks, but it's misleading because we've played a tougher schedule (at least for this far in the season). Before saturday, teams were running on us more and passing on us less than they did on average last year. it wasn't more successful, at least comparing opponents from this year to last, we just haven't played a truly horrible team yet. Even PC is improved compared to last year, and though Gardner Webb is 1-5, their opponents were either FBS or ranked FCS teams who had lost to each other and Samford. We're gonna see our stats go up in terms of sacks and run defense in the next few weeks because the teams we play don't run the ball as well and don't protect the QB as well as the other teams we've played. I feel like a lot of people would have a lot more confidence in this team had we had a few blowouts sprinkled in the early part of the season to have a different frame of how good we are. Remember last year, we beat ETSU and JCSmith early by a combined 80-0. This year, against common opponents with last year we've had a total score of 128-118 compared to 143-119. Though we're about 2 TDs off pace from last year, that' still pretty close. Though it may not have manifest in points quite yet, we're averaging 400 yards a game; last year we didn't even get over 400 yards a game once against any D1 opponent. Our defense looks better when you factor in the overall improvement of the conference, particularly Furman and Western. So I'm not concerned yet. We have a quality team which has made quantifiable improvements this year from an already good team last year(one thing that sticks out to me on pass defense is how fast our DBs are at getting to the ball after the completion...yac yards are hard to come by). We need to finish the next 4 games strong and prove to the country that we are a solid football team. In all fairness, it is a lot to ask a first year defensive coordinator to take many risks; and calling a big time blitz sending 5 or 6 or more and getting burned would be hard to live down. That said, our guys played a great game and had every chance to win the game. I realize that there is a unique circumstance with the defense. It is the offense that I really question. Goodson and Newman are very strong QB's, and we can move the ball when we do it right. We don't need to be cute or tricky to play Wofford football. We let The Citadel, a one dimensional running team, do much too well in their offense. Then we limited Samford to only one dimension and couldn't stop them. We should do better, and I think we will. Boulder - I agree, we should do better. I hope our DC leans a little more on M.A. for some insight. 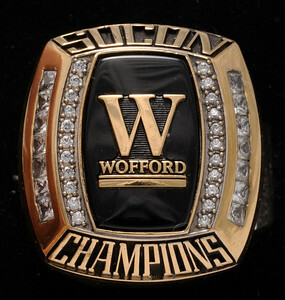 No doubt our guys are Wofford men and great athletes. They answer the bell when called. I remember a few years back under Woody we would drop safeties down into a “robber” and let the corners press and guys like Irvin would rob those inside slants and digs and not give up inside leverage while having a safety roll into the middle third. We did it against Chatt when BJ Coleman was there and had some success, especially getting off the field on 3rd down. Why not roll the dice and try and force some throws if they are shredding us sitting back anyway with the lack luster pash rush? Just some thoughts. Biggest thing is to focus on the next game up, the next man up and get a W and focus on the goal that is still well within reach. They eye in the sky doesn’t lie and I’m sure we will make some adjustments. While we're on the topic of defense, in particular with run defense, last year against our remaining opponents we gave up an average of 45 yards per game, including -7 against ETSU. The teams we're playing aren't air raid offenses and I think we have an opportunity to impress this year. Though we're giving up more yards per game than last year, the run offenses (especially Furman's) are better, but we're still holding every team no less than 40 yards lower than their season average going in. It's really weird that we're doing this, and before Samford had the #1 pass defense in conference (now we're mid-tier, at #5) yet still have only 7 sacks on the year. Why? YT - I think a lot of it has to do with QB’s getting the ball out quicker taking advantage of our cushion with some 3 step drops. Tempo is a killer as well. Guys arent getting the time to get back there and when they do later in the drive I am sure they are a little gassed. I am probably stating the obvious. That’s why I think dropping some guys down and disguising coverages may throw off the timing of these quick throws and allow our guys to get “home” early in drives. 31-0 last year and ETSU couldn't cross midfield. This year 262 yards passing and 2 TD's in a rain laden game. What's changed? Did see us bring a few LB's on occasion and we got a few sacks and turnovers. Doing the same thing over and over and expecting a different result. I think there is a word for that. WocoSix wrote: 31-0 last year and ETSU couldn't cross midfield. This year 262 yards passing and 2 TD's in a rain laden game. What's changed? ETSU was in the second year of their program last year. They're in their third now. They are, collectively, a more mature team and more talented, but they still lack the horses in the trenches to run the ball or protect the QB consistently. By every measure they're better on offense this year than last year. They only broke 20 points once last year against Socon opponents. This year they've done it 4 times and will likely do it for a 5th against VMI. I'm not disappointed with our defense because we're about where we were last year. I'm disappointed that we didn't score more points because they couldn't stop us. We could stop ourselves, but they didn't really stop us. Don't know about that YT. We were 2-3 inches from ETSU tying the game or at least them going for 2 and win. 31 points by our offense should be enough to win majority of games. The Citadel basically had the same score as us but only gave up 180 yds. We better get our defensive pass scheme or personel fixed real quick . Majority of the top 10 national teams are pass happy. Chat has a Freshman QB and IF he lights us up for 250+ will you still say we are on par with last season? Last edited by WocoSix on Sun Oct 29, 2017 10:04 pm, edited 1 time in total.